Thank you all for your participation in this program and for expanding NECA’s grassroots efforts across the country. We look forward to another productive year of one-on-one meetings with your Senators and Representatives – right in your own backyard! The chapter who has the most points by December 31, 2018 will win the Chairman’s Challenge. One free registration to the 2019 NECA Legislative Conference and a special award to be presented at the Association Executive Institute (AEI) Meeting. All participants and the winner will be recognized during the 2019 NECA Legislative Conference. On October 31, 2018, Penn-Del-Jersey Chapter’s Rob Bresnahan of Kuharchik Construction Inc. met with Vice President Mike Pence in Forty Fort, PA.
On November 2, 2018, members of NECA’s Nebraska Chapter met with Rep. Don Bacon (R-NE) in Nebraska. On Tuesday this week, four states (Michigan, Missouri, Kansas, and Washington) held primary elections. 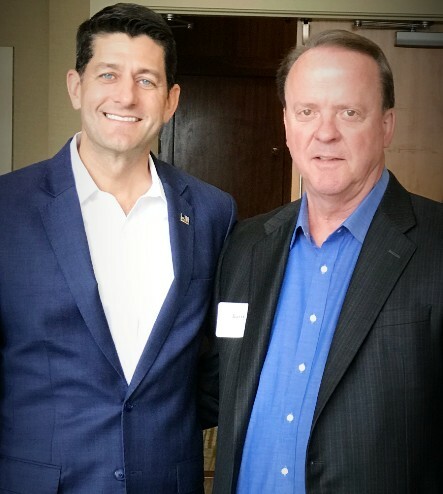 On July 31, Barry Sherman of the Puget Sound Chapter NECA attended an event for candidate Dino Rossi with special guest Speaker Paul Ryan. On July 24, 2018, Members of NECA’s Wisconsin Chapter met with candidate Bryan Steil, who is running to succeed Speaker Paul Ryan (R-WI) in the WI-01 race. Members of the House of Representatives will be home in their districts for the entire month of August. Take this opportunity to meet with your representative and discuss NECA's priority issues!